What can state leaders do to expand access to high-quality career technical education (CTE) in rural communities? That was the focus of an event held last Thursday by the Congressional CTE Caucus, in coordination with Advance CTE. The event featured state and local leaders from diverse geographies, who shared their experiences with delivering CTE in rural communities, highlighting both barriers and best practices. The co-chairs of the Congressional CTE Caucus, Representatives Glenn “GT” Thompson (R-PA) and Jim Langevin (D-RI), also stopped by the event to provide remarks about the value of CTE and weigh in on the state of rural CTE. As Representative Thompson (R-PA), who comes from a largely rural area in Pennsylvania, noted at the beginning of the event, “CTE restores rungs on the ladder of opportunity. We need to make sure that we are dealing with the barriers,” so that CTE can help close opportunity gaps and extend a bridge to lifelong career success. However, rural communities often face obstacles like scarce resources, critical teacher shortages and a limited employer base that make it difficult to deliver high-quality CTE at scale. As Advance CTE found through their interviews with state CTE leaders, these challenges are common across geographies, yet they are often exacerbated in rural communities (find all of the briefs in the CTE on the Frontier series here). How can state and local leaders tackle these challenges? During the event, Dr. Marcie Mack — state CTE director for Oklahoma, spoke about Oklahoma’s career-tech system and the value of employer partnerships in rural CTE, particularly with Oklahoma’s technology center districts, which deliver CTE programs to high school, postsecondary, adult and justice-involved students. We were pleased to also feature on the panel a 2018 Excellence in Action award winner, Traverse Bay Area Intermediate School District Career-Tech Center. Stephanie Long, curriculum supervisor for TBAISD, shared about the difficulty of connecting learners from rural districts with the high-quality CTE programming her career-tech center provides. The center serves a region as large as the state of Delaware, with many students traveling hours a day to get to and from classes. The center provides buses during the day and bus passes after school hours to help these learners access high-quality CTE. As the event’s panelists underscored, CTE is a critical strategy to help rural America adapt to the 21st century economy. The aftershocks of the Great Recession are still being felt in rural America today, where many learners are disconnected from opportunities to reskill and prepare for the jobs of tomorrow. CTE can help these learners build the skills they need for lifelong success and equip them with the knowledge and abilities to adapt to an ever-changing economy. The 2018 legislative session is heating up and, as is tradition in many states, Governors have kicked off the season by laying out their policy agendas in their annual addressed to their state legislatures. Last year, career readiness emerged as a top priority for most states, with 24 governors elevating Career Technical Education (CTE) and workforce training in their speeches. Already, it looks like that trend will continue in 2018. In Idaho, Governor Butch Otter celebrated the work of his higher education and workforce development task forces, which were both authorized by executive order early last year, and committed to implementing their recommendations. These include hiring an executive officer for higher education, expanding capacity at postsecondary technical schools, incentivizing high school CTE programs, and expanding CTE offerings to 7th and 8th grade. Meanwhile, Governor Eric Holcomb laid out an agenda for CTE in his address to the Indiana state legislature earlier this week. In December, the State Board of Education adopted new pathways to graduation that elevate the role of work-based learning and CTE in high school pathways. In his address, Gov. Holcomb celebrated this decision and committed to making the high school diploma even more meaningful by developing K-12 computer science standards, investing in professional development for teachers, and establishing a state work-based learning and apprenticeship office with the goal of doubling the number of work-based learning opportunities in the state by 2019. In other states, governors committed to expanding tuition-free college, investing in work-based learning opportunities, and supporting programs like Jobs for America’s Graduates that connect at-risk youth with education and training opportunities. While only a handful of states have held their 2018 state of state events already, more than half of these speeches are scheduled to take place in January. After a busy 2017, states are turning to the work of executing new policies and programs. In last year’s session, the Indiana legislature outlined a revised CTE funding formula to better align resources with workforce demand. Under the tiered funding structure, programs receive more money if they are in demand and lead to high wages. The new funding formula will not go into effect until July, but programs are already seeing changes to their designations and are anticipating funding shifts. In Michigan, new funding for CTE will soon make landfall through a $5 million competitive grant initiative. The initiative was authorized in November by the legislature and is part of a $12.5 million appropriation for CTE equipment upgrades. Grants will be awarded to school districts in partnership with institutions of higher education and are designed to strengthen high-quality career pathways in high-demand, high-wage fields. (January 17, 3:00pm ET) Leveraging ESSA’s Momentum to Advance Career Readiness: This webinar will share the findings from Advance CTE and Education Strategy Group’s full analysis of ESSA state plans and explore trends across all states. Participants will also hear from state leaders in South Dakota and Rhode Island who are using their ESSA plans to build and capitalize on momentum around career readiness. Participants can register here. (January 31, 2:00pm ET) State Policies Impacting CTE: 2017 Year in Review: Join Advance CTE and the Association for Career and Technical Education to unpack findings from the “State Policies Impacting CTE: 2017 Year in Review” report. The webinar will explore recent trends in state CTE policy and examine how the CTE policy landscape has changed over the past few years. Participants can register here. Putting Learner Success First: A Shared Vision for the Future of CTE reinforces the principle that all learning should be personalized and flexible. Education should meet learners where they’re at, allowing them to pursue pathways and experiences aligned to their career interests. To that end, a number of states this summer have taken steps to expand flexible pathways to graduation by amending graduation requirements and exploring opportunities to enhance career advisement and integrate workforce skills throughout the K-12 curriculum. 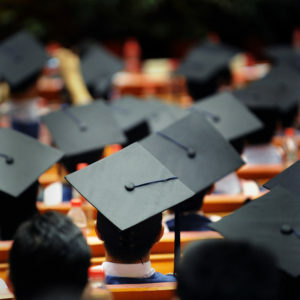 In Connecticut, for example, Governor Dannel Malloy signed SB1026, amending graduation requirements set to take effect this year. Those requirements were adopted in 2010 in an effort to raise expectations, but were too prescriptive in terms of which courses learners would need to take to graduate. Specifically, the requirements increased the minimum number of credits needed to graduate from 20 to 25 and specified that students would need to earn eight credits in Science, Technology, Engineering and Math (STEM), nine credits in humanities, three in career and life skills, and three and a half in other areas, including a senior demonstration project. The new law makes some changes to the required number of credits but ultimately provides school districts and learners more flexibility on the path to graduation. For one, students will now be required to earn nine, not eight, credits in STEM, but local school boards have the liberty to choose which courses qualify. Additionally, the law gives students the option to receive credit by demonstrating subject matter competency through alternative means, such as work-based learning, Career Technical Education (CTE), virtual learning and more. And instead of the senior demonstration project, learners must complete a mastery-based diploma assessment. Over on the west coast, Washington State’s budget for the 2017-19 biennium includes provisions to accelerate the state’s ongoing credit equivalency work. Under the enacted budget, the Superintendent of Public Instruction is directed to help expand and support the implementation of course equivalency credits statewide. This builds upon an ongoing state effort to streamline graduation pathways and allow students to earn math and science credit by demonstrating competency through technical coursework. Since 2015, the State Board of Education has established course equivalency frameworks for 32 courses, including the Core Plus curriculum, a model developed in partnership with the Boeing company to help students develop knowledge and skills in manufacturing. Additionally, the budget provides for a competitive grant fund to help school districts implement the course equivalency frameworks, such as by developing rigorous assessments, raising awareness and providing professional development for educators. Meanwhile, efforts are underway in Idaho, Michigan and California to align K-12 education with workforce development priorities. In Idaho, Governor Butch Otter’s Workforce Development Task Force, launched by executive order in January, released its findings and recommendations from a five-month study into the state’s workforce development needs. Among the task force’s recommendations are strategies to connect K-12 education to career pathways, strengthen career advisement in the state, expand CTE programs and apprenticeships, and incentivize schools to integrate workforce skills into secondary curricula. In Michigan, the Career Pathways Alliance — a Governor-led, cross-sector effort — released a series of 16 recommendations to dramatically strengthen career preparation at the secondary level. Proposals range from continuing a statewide communications campaign to enhancing career counseling efforts and introducing more flexibility into the Michigan graduation standards, an effort currently making its way through the state legislature. While many of the Alliance’s recommendations require legislative approval, State Superintendent Brian Whiston issued a directive immediately after the recommendations were released to begin implementing some of the strategies. Meanwhile, California is taking steps to develop and integrate computer science standards into K-12 curricula. The state’s budget directs the superintendent to convene a Computer Science Strategic Implementation Advisory Panel to provide recommendations for implementing K-12 computer science standards. Specifically, the panel’s recommendations, which are due to the superintendent by July 2019, will address professional development for teachers, define principles for meeting the needs of K-12 students, and identify strategies to expand access to computer science education. The Every Student Succeeds Act (ESSA), reauthorized in 2015 under President Obama, affords states great opportunity to promote career readiness by updating state accountability systems, providing supports for teachers and leaders, and ensuring students can access a “well-rounded education,” including opportunities such as Career Technical Education (CTE). With the first submission window for ESSA plans now officially open, several states have stepped up to the plate, signaling a new era of career readiness. This week’s submission window comes after recent changes to the ESSA plan submission process threatened to derail the timeline. After Congress exercised its rarely-used Congressional Review Act authority earlier this year to revoke certain ESSA regulations, Education Secretary Betsy DeVos urged states to stay the course and continue their implementation efforts as planned. Earlier in March, Sec. DeVos released an updated template reorganizing the structure of the state plan and eliminating a few requirements from the Obama administration’s version, providing additional flexibility to states. While this reduced the turnaround time for states to prepare their final plans, states are permitted to submit plans as late as May 3 to provide the governor 30 days to review the final version, as required by statute. States took these changes in stride, though some are reconsidering their approach to public data reporting. The accountability regulations repealed by Congress earlier this year encouraged the use of a “summative rating” to differentiate school performance. Now that the rule no longer applies, many states are rolling back A-F school report cards in favor of multi-measure dashboards. These changes are largely a response to criticism from local superintendents and other stakeholders who claim that summative reporting is overly simplistic and fails to provide a nuanced picture of school quality. Eighteen states have signaled they will submit ESSA plans during the initial review window, which opened on April 3. Of those, nine have already submitted plans to the U.S. Department of Education. While Montana and Ohio originally opted to submit by the April 3 deadline, they have since delayed their plans to allow more time for stakeholder engagement. They, along with the remaining states, will submit in September. Connecticut, which plans to adopt three measures of college and career readiness, including preparation for coursework, preparation for exams and postsecondary entry. 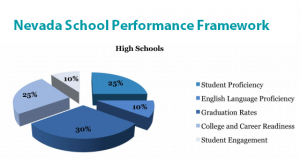 These measures examine preparation for two-and four-year colleges as well as participation and success in CTE courses and workforce experiences. Michigan, where policymakers exceeded federal requirements and identified a total of seven different indicators (ESSA requires five). Under the state’s plan, the accountability system will measure “Advanced Coursework,” to include successful completion of dual enrollment, middle early college, CTE, Advanced Placement or International Baccalaureate coursework. The Advanced Coursework indicator, along with other non-academic indicators, will together be weighted at 14 percent of the total score. Nevada, which aims to adopt a “College and Career Readiness” indicator measuring ACT assessment scores, completion of college credit bearing coursework (AP, IB and dual enrollment) and industry-recognized credential attainment. That indicator will make up 25 percent of the state’s overall accountability score. Other states such as Colorado plan to adopt additional indicators a later date once better systems have been developed to reliably collect and report data. Colorado plans to convene its accountability workgroup again this spring and will explore possible measures of career readiness, including completion of advanced coursework, students graduating with college credit or an industry credential, and post-graduation employment. Additional career readiness strategies are present throughout state draft plans. In North Dakota, state policymakers singled out ESSA’s “well-rounded education” requirements to promote CTE, competency-based learning, personalized learning and Science, Technology, Engineering, Art and Math (STEAM) programs. The state plans to use ESSA’s Student Support and Academic Achievement Grants (authorized under Title IV Part A) to strengthen well-rounded education opportunities and prepare students for postsecondary success. And in Maine, the Department of Education plans to continue its ongoing Intersections Workshops, which bring together academic and CTE teachers to identify intersections across different content standards. This work was originally started after the state adopted a competency-based education system in 2012. The first round of state ESSA plans indicates enthusiasm and willingness to leverage federal policy to support career readiness. And even states that do not currently have the technical capacity to do so are taking steps to adopt such measures. With months remaining until the second submission deadline in September, we encourage states to examine ESSA’s increased flexibility and seize the opportunity to strengthen career readiness systems statewide. Next week, companies from across the nation will meet in Seattle to host a job fair for 16-24 year olds. This is part of the 100,000 Opportunities Initiate, a coalition of 40 U.S. companies who are working to employee the 5.5 million young Americans out of work or school. In another investment to address the skills gap, U.S. Chamber of Commerce Foundation and USA Funds partnered to pilot a program with the goal of closing the skills gap. Talent Pipeline Management put employers at the lead of education partnerships in seven communities across the country. A number of policy changes, programs and partnership have followed in states such as Virginia, Michigan and Arizona. CTE Month is off to an incredible start! Only four days in, the #CTEMonthÂ hashtag has already been used 1,500 times on Twitter in posts that feature CTE facts, photos of students at work, resources to use during the month, and support from advocates in fields spanning education, policy, funding, business, media, research, and more. For our inaugural 2016 CTE Month post, weâ€™ll kick off by highlighting how a few states are promoting CTE during the month. Wisconsin is encouraging their networks to celebrate CTE Month in variety of ways, one of which includes providing accessible and easily adaptable tools for schools and CTE organizations to use such as the 2016 CTE Month logo, a state-wide social media calendar, and a variety of proclamations from FBLA, FCCLA, FFA and SkillsUSA declaring February CTE Month. They also have support from Tony Evers, the State Superintendent, who authored an editorial discussing the importance of CTE in Wisconsin. Maryland also supplied a ton of resources to their state network including a sample news release, template to create a student profile, CTE Month certificate and a public service announcement. Additionally, they suggested ways to acknowledge CTE Month at both the high school and middle school levels. Missouri is utilizing the radio to get their CTE message across, by launching 30 second radio spots running in large, medium and small markets throughout the month to provide the general public with more information about CTE. In Michigan, all Department of Education employees were asked to use the Learning that works for Michigan logo in their e-mail signatures. You can join the campaign and receive your own state-specific Learning that works logo here. CTE Month is not only about raising awareness, but also celebrating the successes of all that it takes to makes a CTE program great. Oklahoma is honoring the contributions made by CTE teachers by distributing a hardcopy booklet, which was given to legislators at the Capital during CTSO day on February 2. A digital version is featured on Oklahoma Horizon, a weekly television showâ€™s website, and throughout their social media. Pennsylvania is partnering with the Pennsylvania Association of Career and Technical Administrators to recognize each of the student organizations at a celebratory dinner for CTSO students and Pennsylvania legislators. Additionally, award recipients of the stateâ€™s newest awards program – Â the Career and Technical Education Excellence Award, which recognizes high schools and career and technical centers where 75 percent of students have achieved advanced technical assessments â€“ will also be in attendance. Let us know what you are doing for CTE Month by emailing kfitzgerald@careertech.org, or tagging us in your Twitters posts @CTEWorks. CTE Research Review: How Did England Triple Its Apprenticeships? Itâ€™s National Apprenticeship Week! The Obama Administration has been raising the profile of (and funding for) apprenticeships through several initiatives. The most recent effort comes from the U.S. Department of Labor, which unveiled its ApprenticeshipUSA Toolkit last week. The toolkit includes resources to learn about apprenticeships and their benefits, tools to build strong partnerships and apprenticeship strategies, and ways to help implement a fully integrated program into a state or local workforce system. It also features case studies and videos from Iowa, Michigan and Vermont. You can also check out last weekâ€™s webinar for a helpful overview of toolkit. How Did England Generate Two Million Apprenticeships? The Urban Institute, a Washington-based think tank, hosted the first Transatlantic Apprenticeship Exchange Forum to learn more about how England tripled its apprenticeship offerings. The Exchange featured nearly 20 U.S., British and Australian experts and apprenticeship leaders that explored methods for scaling successful and innovative programs including how to recruit employers and support apprentices. Be sure to check out the full slate of presentations and a video of the event to learn more about the British and Australian approaches to expanding apprenticeships. For the U.S. perspective, hereâ€™s a refresher on a 2014 thought piece from the leading U.S. expert on apprenticeships, Robert Lerman. A new brief from Achieve and NASDCTEc argues that states can and should leverage CTE when considering how to move K-12 education toward a system marked by mastery, not time. 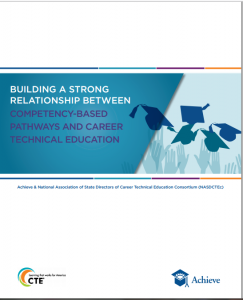 The paper, â€œBuilding a Strong Relationship between Competency-Based Pathways and Career Technical Education,â€ identifies the opportunities for collaboration and strengthened relationships as well the challenges of creating an integrated system. Competency-based pathways (CBP) have the potential to open new opportunities for students to learn and demonstrate their learning in meaningful ways. To do this, students should be able to access engaging learning opportunities that are grounded in application and relevant to their career goals â€“ a central focus of CTE. This is why state leaders should consider how to ensure that CBP and CTE systems are aligned and mutually reinforcing. In fact, states that intentionally include CTE in their vision for CBP can use its inherently competency-based elements to help break down the classroom walls that separate academics from CTE, and by doing so, can value learning where it happens and create opportunities for teachers to collaborate and innovate. The brief includesÂ state examples from Colorado, Connecticut, Illinois, Kentucky, Maine, Michigan, New Hampshire, Ohio, Oregon, Rhode Island, and Vermont. Read more about how states are implementing CBP here.